Read more about our new robotic surgical system, seasonal affective disorder and our nurses who were recognized by the Texas Nurses Association. The Heart Hospital at Northwest Texas Healthcare System is the leader in heart care in the Panhandle. 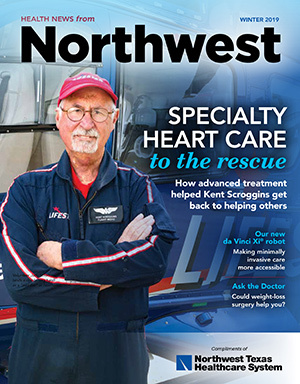 Kent Scroggins knows this firsthand, both as a paramedic and a patient. “If you are struggling with weight loss or you have developed medical issues related to your weight, you should reach out to a weight-loss surgeon and at least hear all of the options,” says Bo Neichoy, MD, FACS, director of Northwest’s bariatric surgery program.